Robert Dugoni is the #1 Amazon and New York Times bestselling author of My Sister's Grave. Dugoni is also the author of the critically acclaimed David Sloane series--The Jury Master, Wrongful Death, Bodily Harm, Murder One, and The Conviction--as well as the bestselling standalone novel Damage Control and the nonfiction exposé The Cyanide Canary, a Washington Post Best Book of the Year selection. Dugoni's books have been likened to those of Scott Turow and Nelson DeMille, and he has been hailed as "the undisputed king of the legal thriller" by the Providence Journal. Visit his website at www.robertdugoni.com. Follow him on Twitter @robertdugoni and at Facebook at www.facebook.com/AuthorRobertDugoni. In "Her Final Breath" Tracy Crosswhite is back & after learning who was her sister's killer, she is now on a case where there is a serial killer hog-tying victims. When she is on a shooting range and finds a noose left for her she realises that the killer may be targeting her. As a homicide detective for the Seattle PD, it is not unusual that she is hunting a serial killer. This prolific killer is dubbed The Cowboy for the way he hogties his victims before strangling them. 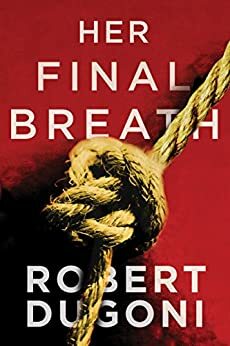 Tracy doesn't want to let the victims down and she, along with her task force run down every lead, trying to find a thread that will take down this cruel murderer. When Tracy's boss puts her in charge of a task force to capture The Cowboy it comes as a bit of shock especially since they both have issues with each other. With the help of her colleagues they work around the clock trying to capture this serial killer before he strikes again but will they catch the right guy? While working to capture The Cowboy Tracy seems to have a stalker but who is it? Is it this serial killer or is it someone else entirely? The author did well in building suspense and having you guess until towards the end who the killer is. I like having a female detective in stories and seeing how they solve crimes and deal with things that come their way. Once again, I had trouble figuring out who done it which is unusual for me and heightened the enjoyment factor of this book. I love when I really have to struggle to work through the clues. The Tracy Crosswhite character is so well written that the reader feels like they're getting to know a friend as they read her harrowing journey to stop a killer. Rooting for the good guy is always a perfect place to be as a reader when an author writes a fabulous character. I found myself hating Tracy's boss so much I would yell at the novel when Nolasco would thwart Tracy's efforts to do her job. I especially love books that make me feel emotions strongly. Dugoni not only wrote a five star novel here, with a mystery that keeps you guessing but he also bloomed a fantastic character in Tracy Crosswhite. I can't wait to read the next in this series. If you haven't read the first book that is okay I think this book works as a stand alone, but there are some things that happened in the first book you'll just have to accept as a given. What a ride! This story takes you through some creepy, scary and at times frustrating moments, especially betweem Tracy and her crooked boss Nolasco. The perseverance of her hunt for the serial killer was tenacious even with Nolasco's interference, and those moments with Dan were adorable. Looking forward to reading the rest of the series. 5.0 out of 5 starsGripping tale. This kept me engaged from beginning to end, tho I have to boast I figured out who the baddie was! Well worth reading for fans of this genre. Anothwr great read! Thank you Robert Dugoni for leaving me in suspense when I had to stop reading to go to work. So looking forward to book 3 in The Tracy Crosswhite series. Its hard to imagine what goes thru the minds of real killers and why they do it. Absolutely superb crime writing.. Read the first one and just had to have this one.. I thought I knew who the murderer was but was wrong.. Enjoyed this as much as the first and have now purchased the 3rd one in the Tracy Crosswhite series.. I stumbled across this series while looking for something akin to the Jack Reacher series. This is different but a thoroughly enjoyable read. Plot and characters build well and in both books so far the ending wasn't predictable. Both the Tracy Crossthwhite books have been excellent. Not 'over the top' or unbelievable. I have enjoyed them both for the twists and turns which I'm sure is true in all police work. The Interweave of story lines was skilfully executed but the painting of the small details is what breathed life into the narrative and brought me pleasure.